I decided to try this painting again, hoping the cat wouldn’t walk on it this time. I tried a lot of wet in wet, hoping to get some dynamic movement from the pigment settling and blending in the water. I like how it came out for the most part. If anything this is a really good exercise for me in learning to allow mistakes to remain unresolved. I started with a very quick sketch, and then a loose wash for the back ground. Then, I dappled the purples and greens and golds in to set the table for the trees leaves. 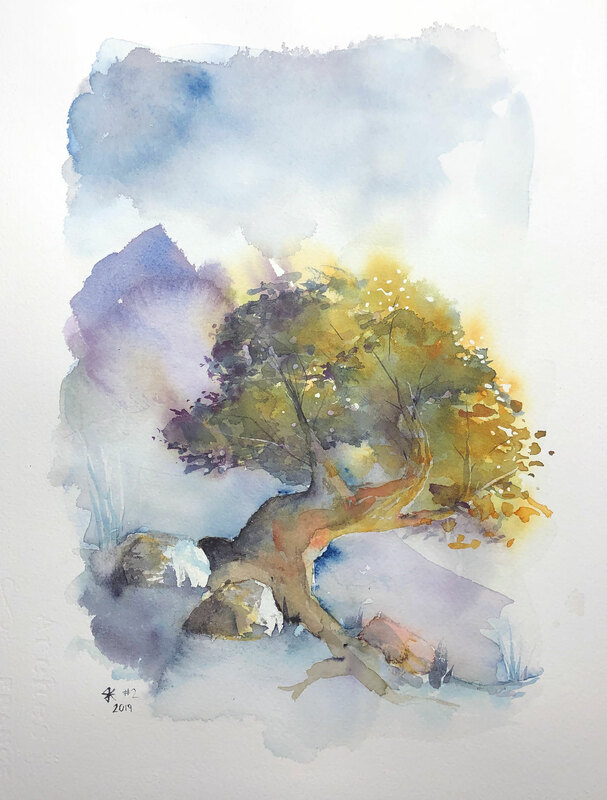 I did this while the background was still wet so I could get some soft edges on the tree. Once that dried I painted the leaves in layers of wet on dry. After the leaves, I painted the trunk which I had masked off earlier. I wasn’t able to achieve the effect I wanted with the first pass, so I tried a second pass, and a third, and the light started to die. Once I gave up on the tree trunk, I painted the grass and the rocks. I wanted to use a limited palette, so I used the gold from the leaves and the blue from the sky to make the green in the grass. When that was done, I realized that the composition needed another line to balance (or to counter-balance, rather), so I added the purple mountain. That’s all. I might try again.